Meet Carmen! She LOVES the spotlight and applause. She’s an actress, a singer, a dancer—a one-girl sensación! She exhausts her parents with her nightly performances and completely overshadows Eduardo, her adoring little brother. But when Eduardo shows his big sister how much he loves her in a way even Carmen can’t ignore, will Carmen realize that the stage is big enough for two? Exuberant illustrations by Lorena Alvarez Gómez offer the perfect complement to Anika Denise’s warm, Spanish-sprinkled text in this celebration of theater, family, and imagination. “Smartly, the narrative depicts all Carmen’s activities as creative work; it’s not just about the performance, but also building and rehearsing. And her parents (dark-skinned mom and light-skinned dad) accommodate her dreams while also realistically hoping to enforce bedtime and make sure Eduardo doesn’t get left in the shadows. The art seems to leap off the page, turning Carmen’s stagecraft into magic, whether it’s colorful pirate seascapes or robot rock operas. The mix of detail between home decoration and wildly over-the-top costumes and props is well-balanced and rich. 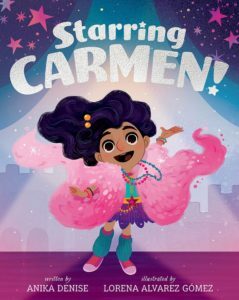 For caregivers of extremely extroverted kids, Carmen’s ambitions will feel very familiar; for kid readers, Carmen and Eduardo’s very fun activities might inspire some musical productions at home.